One of the main problems with incandescent lights is the life span. They are rated for 1500-2500 hours but that is under ideal conditions. The handling of the lights when they are being installed in socket runs where they get drug across the ground, rattled against the house or gutters as they are being pulled up and installed really takes a toll on the fragile filament inside the bulbs. A good analogy would be to imagine dragging your fine China across the lawn, up the side of the house, and over the edge of the aluminum gutters and expecting it to not take a beating that would shorten its fragile lifespan. This all takes a toll on the fragile filament inside the bulbs where they often start to fail in small numbers after only one (42 hours) or two (84 hours) seasons of use. The LED bulbs are made of very durable faceted plastic that can take a lot of abuse and still last for 50,000 hours. 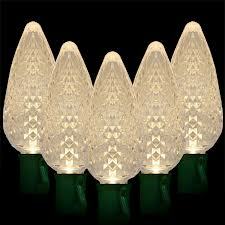 The five light emitting diodes inside the bulb are very durable. They will never shatter like incandescent bulbs and shower the landscape with shards of fine glass that are impossible to find and cleanup. You can accidentally drop an LED bulb off the roof onto the ground and it will still work. For every watt of power used over a six week season the cost is about 2.55 cents. One C9 LED bulbs will cost you 1.15 cents per season while the incandescent C9 will cost you 17.9 cents. This means for every LED bulb used your going to save 17.65 cents per season. On an average house that might use 250 bulbs the LED’s will save you $41.25. For a commercial display that stays on all night you can double the savings to $82.50. The savings per year will cover the cost difference of buying about 41 LED bulbs or 82 for a commercial display. With Christmas lights the displays must have all the lights working in harmony or you end up with voids in the display that really stand out. Even on office building with hundreds of C9 lights that are 500′ away from you it’s easy to count every single bulb that has failed. The failed bulbs really stand out like a black eye. Most companies that are still selling incandescent lights will tell you that they are not going to come replace a bad bulb or two in your display because failing bulbs are to be expected to a certain extent. Companies require a certain number of bulbs in a row or a set number in the total display to be out before they will replace the bulbs. 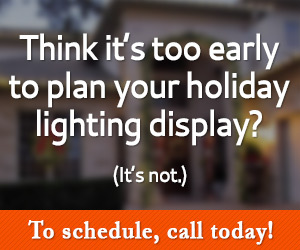 With incandescent bulbs you have to get accustomed to often having a less then perfect looking display. LED does cost more then incandescent but it’s worth it if you are a perfectionist. 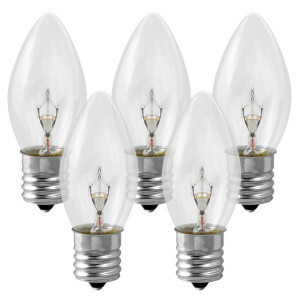 An incandescent bulbs retails for 22 cents while a Minleon bulb will cost $1.80. Even thought LED bulbs cost about 800% more then incandescent bulbs it is not reflected in our pricing. While many incandescent installers sell their material for $2.50 a foot with Plantscape Solutions you can get the premium Minleon LED C9 lights starting at $3.15 to $3.50 per foot depending on the current specials. For a mere $1 a foot difference or less on average you can get a much better return on your investment. At first it’s easy to think lights are lights and going the cheaper incandescent route is a better buy. But once you realize that your dealing with outdated, unreliable, and power hungry technology the deal doesn’t look as good. Comparing Incandescent bulbs to LED is like comparing the old cheap $4000 Yugo car from the 80′s to a modern Tesla electric car. Spending any money on a Yugo in the 80′s was a bad deal and investing in incandescent is often not much different.